Mike Bright, five time winner of the Manhattan Beach Men�s Open, was a 6�4", 195 pound player. He was an All-American from 1960-1964. He played on the 1964 Olympic Team and on the 1960 Pan Am Team. 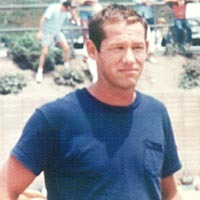 During his era, Bright was considered one of the "new breed" type of players that became a force in the game of beach volleyball. Bright was a tall player that utilized his height to invariably put the ball away. Bright was very accurate, rarely hitting a ball out of bounds. In the early 1950�s, Bright began his beach volleyball career on the sands of Hermosa Beach, while in the seventh grade, but not seriously. Bright grew up in Hermosa Beach, in the hub of the South Bay�s beach volleyball at 17th Street. Mike "Bones" Bright was a member of the "17th Street Seals" which was a local surfing club back in the 1950�s and 1960�s. As a club member he was involved in surfing, paddle-boarding, and volleyball. His first introduction to the game of beach volleyball was on a typical Sunday afternoon, at Shattuck�s walk street court, on 9th Street in Hermosa Beach California. Bright began to play more serious volleyball in the late 1950�s, and the results were spectacular. Mike Bright participated in 44 Open tournaments, on the beach volleyball circuit, from 1958-1970. He advanced to the championship match 34 times, winning 16 times, along with 6 third place finishes, 1 fourth place finish and 3 fifth place finishes. Bright teamed-up with 10 different partners during his beach career, including 25 time with Mike O�Hara. At Age 21, Bright teamed with Mike O�Hara, forming the best blocking duo of their era while winning a bunch of beach opens including the premier tournament of the 1950�s at State Beach. Bright and O�Hara also won the first five Manhattan Beach Opens together, from 1960-1964. Bright and O�Hara won 12 tournaments together. Bright�s career included a total of 16 championship victories. Their total of five consecutive Manhattan Beach Open victories still remains an un-broken record. Bright and O�Hara were the first to team to utilize their indoor blocking skills in the beach game, however at this stage of the game it was illegal to break the plane of the net with their hands. Mike Bright had many indoor volleyball accomplishments to go along with his many beach performances. Bright rates his three wins over the top-rated beach team of Ron Lang and Ron Von Hagen, during the 1967 season, as one of his top beach feats. Bright has always been known as a modest man, but no amount of modesty can counteract his outstanding record, it speaks for itself. He played both beach and indoor�s equally well. Olympian Rudy Suwara said this about Mike Bright: "He was a great all-around player who won with many partners." Mike Bright�s beach volleyball career was cut short by a diving accident.